A new cupola was donated in Pezzuco Construction’s name. Initially, we relocated the existing town hall building, and then constructed a new two-story building with a full basement and elevator adjacent to the relocated building. We created a modern town hall with ample space for all departments in order to make employees and visitors feel more at ease. After Jamestown solicited bids for the project, Pezzuco Construction was interviewed along with two other general contractors. We were awarded the project based on our qualifications, commendations and reputation. Pezzuco Construction assisted the architect and owner with a review of the plans and revealed numerous cost saving ideas to maintain the essence of the building, but also retain the budget. The Pezzuco Construction staff served as a general contractor providing daily supervision of the project. Pezzuco labor forces also performed the framing and siding scope of work. 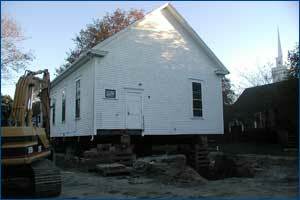 The existing building had to be shored and relocated. The original molding of the existing building had to be duplicated to match in the new, adjacent building to maintain continuity. The transformation of the council chamber was also a unique and challenging feature that ended up being one of the most beautiful rooms in the two buildings.